Choosing the right new windows for your home is a big decision. You want them to look great and work for decades to come. There are many window styles from which to choose when it comes time to purchase your new windows. In part 1, we covered single-hung, double-hung, and casement windows. Click here if you missed part 1. Today, we’re going to look at sliding windows, picture windows, awning windows, and transom windows. Sliding windows are like sliding glass doors in that they slide from one side to open. They are, essentially, a single-hung window on its side. They are a popular window style when you want a large expansive view as they rarely have window grids. 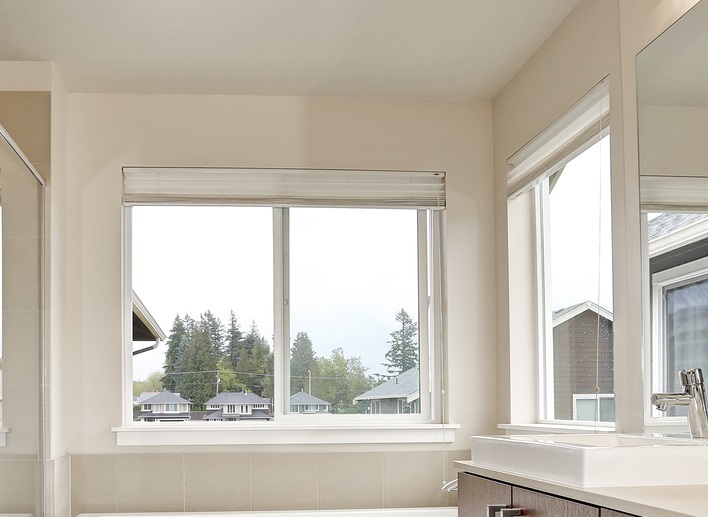 One drawback to choosing sliding style new windows is that depending upon the height of the window, they can be difficult to slide open due to their size. If you want an unobstructed view but don’t need the window to open, a picture window is a great option. Because a picture window is basically just one piece of glass in a window frame, a benefit is that with no moving parts, they rarely leak. They also come in many sizes and shapes and are less expensive than other window styles. Many people choose a picture window surrounded by two casement windows to have some airflow to enhance the expansive view. A less popular window style in homes is the awning window. Awning windows are like casement windows except they open like an awning. Some people choose awning windows above or below a picture windows or other windows when they want airflow. They are also popular in basements where there is only a narrow space for a window. One benefit is that they can be left open slightly in the rain without water coming in. Rarely is an awning window the only style window in a home. Another window style that doesn’t open is the transom window. Transom windows are used in conjunction with other windows to let more light into a home. They are situated above another window or door. A transom window is usually a narrow rectangular window. If a transom window opens, then it is an awning window or sliding window depending upon how the window operates. When you’re ready for new windows for your home, Blair Windows and Doors wants to be the Indianapolis window company you choose. We offer many brands and styles of replacement windows and can help you choose the best option. Call 317-356-4666 to schedule your in-home consultation today. Blair Windows & Doors, Inc.